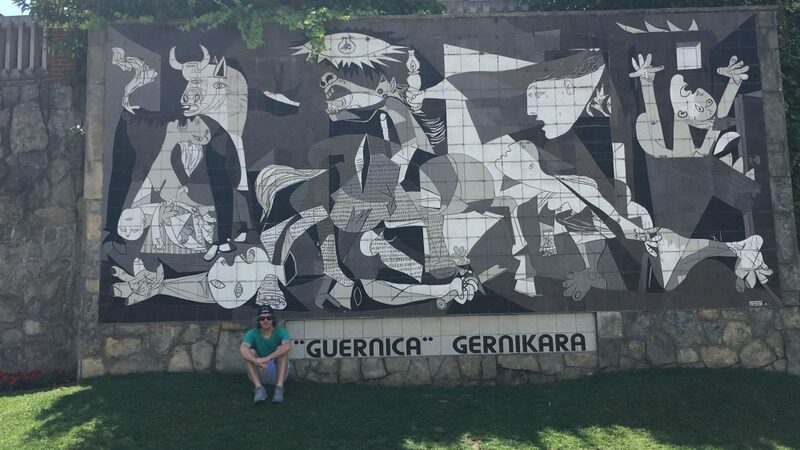 Complete an immersion study experience in Paris, Barcelona, Málaga and Madrid to contextualize the environs that influenced and impacted the life and art of Pablo Picasso. 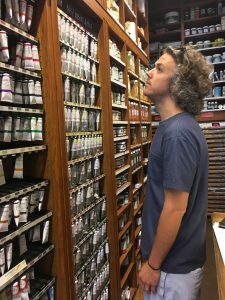 Shopping for paints at Sennelier, where Picasso purchased supplies. The knowledge and insights I gained into the cultures and environments that impacted Picasso’s life and art have grown immeasurably as a result of my fellowship. Coupling this with my newfound knowledge of him as a person and an artist, as well as the complexity of his background, provided me with an understanding of how each of these elements are displayed in his work. I now feel capable of presenting these characteristics and experiences to my students and school community effectively. First and foremost, my capacity to teach art in Spanish now exists, which it previously did not (except on a superficial level) as a result of: 1) the instruction I received from multiple museum staff members on art creation, appreciation and analyzation; and 2) having now observed, analyzed and appreciated the art of so many Spanish and Latin artists. Where I previously included art in my instruction, I will now be able to embed art in my instruction as a means for dialogue and inspiration. Living for a month in Spain has to be the greatest personal accomplishment of my fellowship. During the writing of my proposal, I regarded being a Spanish teacher who had never been to Spain as a personal and professional deficiency. I can now state that deficiency has been satisfied with incredibly memorable experiences and professional growth. The fact that the entire fellowship was centered around the study of one of my Spanish heroes enhances the richness of each experience. I will now be able to provide my students with the opportunity to use art in their weekly Spanish instruction. The authentic resources I was able to collect during my fellowship will provide them with quality enrichment tools to better connect with the experiences of Picasso and the culture of Spain. Using all of these resources together will allow us to create a positive social emotional learning environment that up to this point has been challenging to build within a language classroom. In collaboration with the humanities teachers at my school we developed an interdisciplinary unit to cover the life and times of Picasso. Students will research and discuss the major world events that parallel Picasso’s lifetime in tandem with a micro focus on specific events that happened to Picasso. We will then combine these into an evaluation of his work and what influences we can see in his choice of subject, color, technique and message before students begin making their own artwork. I envision celebrating my students learning by highlighting their work to peers, families and school community. This will be achieved in multiple ways, including classroom and hallway displays, submittingstudent work in our monthly International Baccalaureate and Montessori newsletters and posting them to my school community Instagram account. Where I intend to look for solutions or build greater connections is through the social emotional learning aspect of the unit I developed using the knowledge, resources and tools I have gained from this experience. Employing my skills and capabilities to help students better understand and express themselves through art and writing and, in turn, build their capacities and skills to interpret and empathize with the messages communicated by their peers, thus building better relationships. To a grant funder I would start by telling them thank you. To a friend I would tell them to apply now. There is no substitute for travel, experience, learning and growth. This fellowship provided me with the opportunity to fulfill multiple personal and professional goals. Fund for Teachers gave me a refined focus and a renewed passion. I’ve elevated my expectations for my students to be proficient communicators, while also including a space for them to build connections through creativity and Picasso. Don’t forget to check out the previous three posts in our Passport to Learning series, featuring fellowships about British literature, African culture and biophilic design. 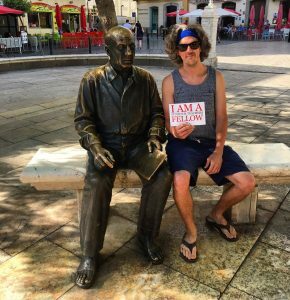 Nolan Hanson (pictured with Picasso) is a pre-K through 8th grade Spanish teacher at Oscar Mayer Elementary School in Chicago, Illinois. 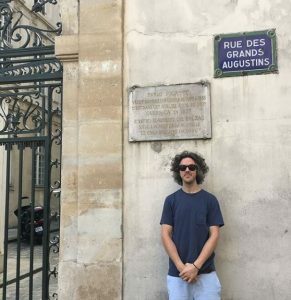 For the past 5 years he has built his classroom around the idea that every child has a unique background and learning style that should be fostered to embrace diversity and global citizenship. When he is not teaching in his classroom, he is committed to completing service learning projects with his middle school students, who have been honored at WE Day for the past 3 years. Enjoy more of his fellowship photos on Instagram.